Owing to our state-of-the-art infrastructure, we are able to offer faultless Magnetic V Block UL-320 Series. Our Magnetic V Block UL-320 Series has uniform and Strong magnetic pull to all three magnetic surfaces such as top, bottom and V faces. 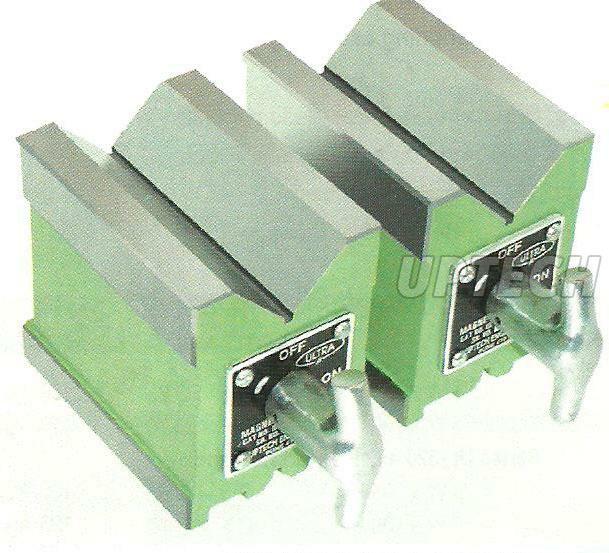 The Magnetic V Block UL-320 Series is supplied by us in matched pair. Our Magnetic V Block UL-320 Series are demanded all over the country due to their easy on-off amenities. Angle Available : 120o "V"
Uniform and Strong magnetic pull to all three magnetic surfaces, Top, Bottom & V Faces. Easy ON - OFF facility. 120o "V" angle also available.